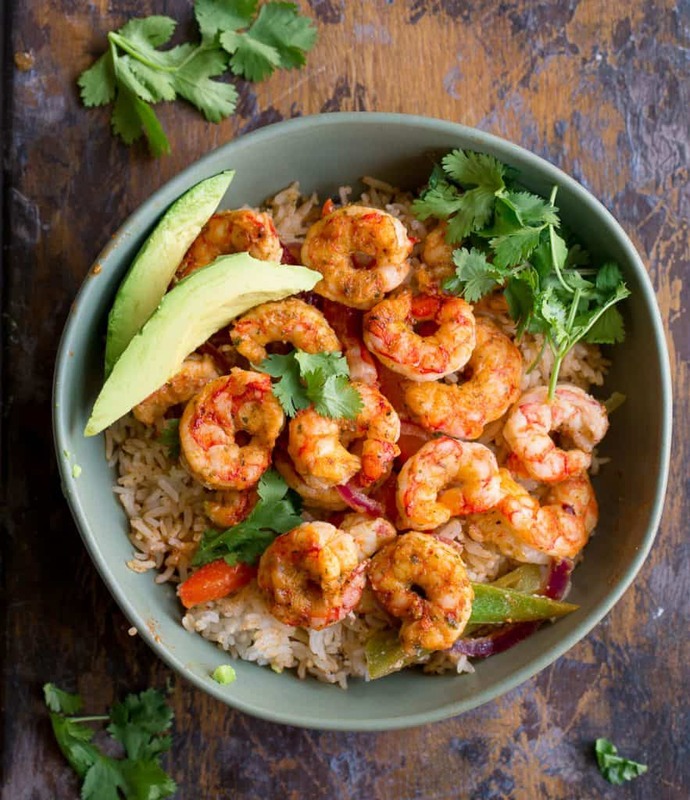 A one pan, healthy meal that combines a delicious marinade and blend of spices, juicy shrimp, some fresh veggies; all while alleviating your meal planning stress! 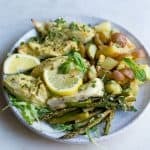 This simple dinner can be made in less than 20 minutes. 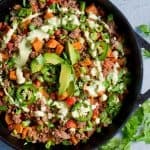 Serve over a bed of greens, cauliflower rice, or in tortillas. Another week, another taco recipe. That’s how we roll around here. You too? I knew I liked you!! 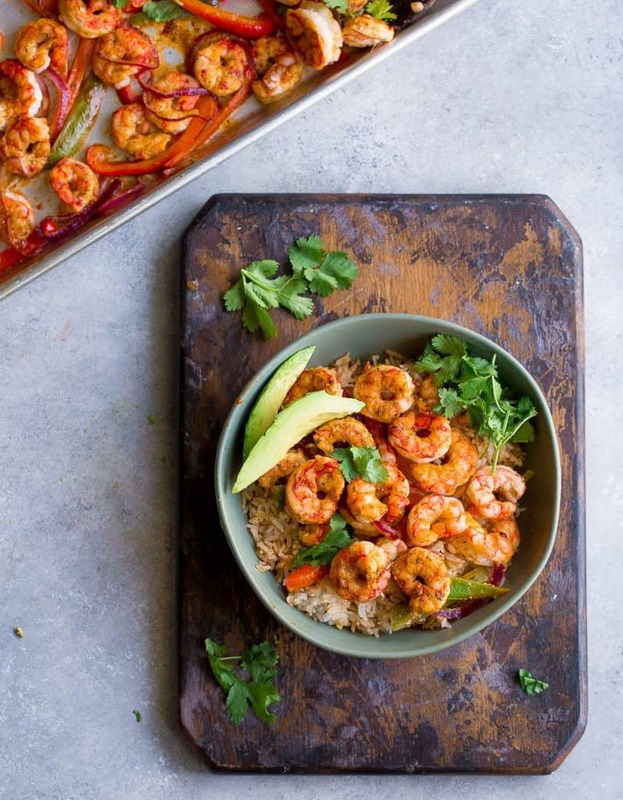 File this recipe under the quick, tasty, healthy, vibrant, shrimp recipe that looks like you put in Sunday effort, all for Friday night’s level of effort (read: very little work). Yup! That’s what this Sheet Pan Shrimp dinner is all about. 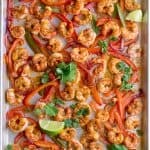 I love the fact that shrimp on a sheet pan is about the fastest thing ever in the oven. 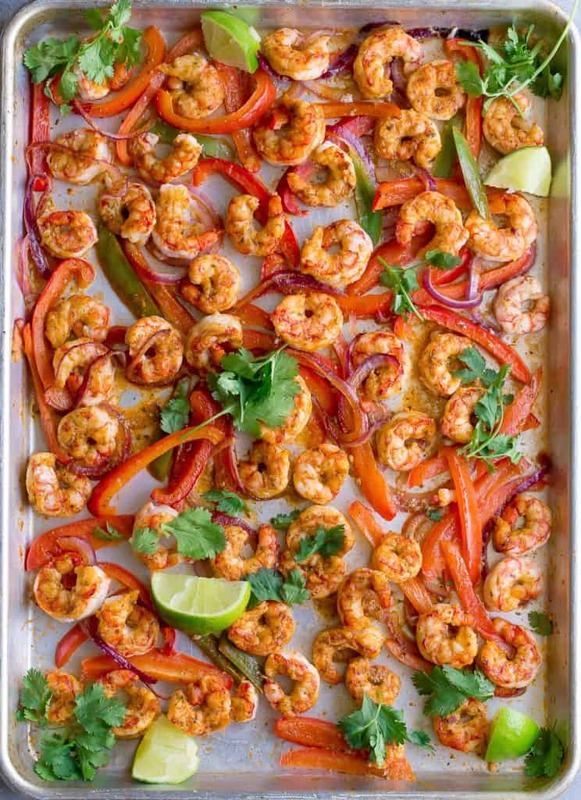 More importantly with shrimp on the sheet pan, is that we need to add in plenty of flavor and spices to elevate our shrimp game. A thick taco sauce that coats the shrimp, and veggies to throw in for additional flavor and texture. 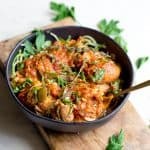 This recipe has it all!! Another brilliant Taco Tuesday is right here ready for you! 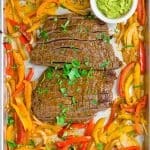 And if you want to call these fajitas? I’m totally on board with that. I almost did myself after adding the addition of bell pepper and onion. I kept with the taco theme because of the thick “paste” that is made from the marinade. For serving, a bowl of greens, rice, or cauliflower rice is perfect. Or tortillas! And you must add all of the toppings. Kind of non-negotiable in my opinion. Salsa, avocado, fresh cilantro, lime juice, ect. 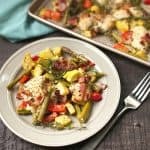 This recipe is also fantastic for meal prep! Make on the weekend, and enjoy shrimp taco bowls throughout the week. Preheat the oven to 450 degrees. 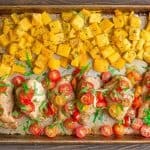 Line a large baking sheet with foil or lightly grease with a non-stick spray. Set aside. Prepare a quick marinade for the shrimp. 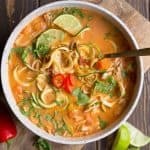 Blend in a food processor or blender: oil, juice of 1 lime, tomato paste, coconut aminos, vinegar, chili powder, cumin, chipotle powder, salt, and cilantro. Pour marinade over the shrimp in a bowl while the oven heats up. Line the veggies over the bottom of the sheet pan. Pour shrimp and marinade over the top; spread around the marinade to evenly coat the vegetables. 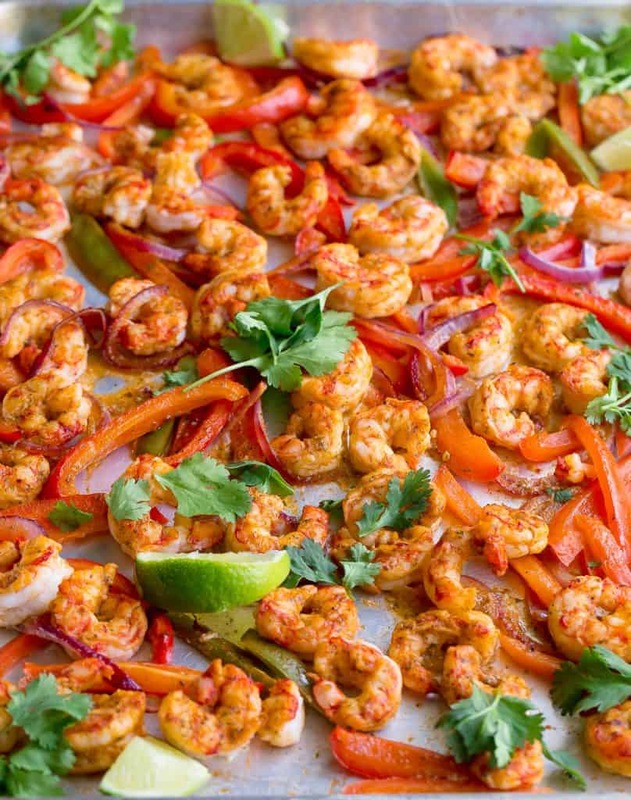 Place in the oven and roast for 8 minutes, then broil for an additional 1-2 minutes or until shrimp is cooked through. *You can also use soy sauce or GF Tamari Sauce in place of coconut aminos.